Well after doing a Rocky reenactment last night, Nathan and I went out to get a little food and the chicken fingers hit the spot just right. 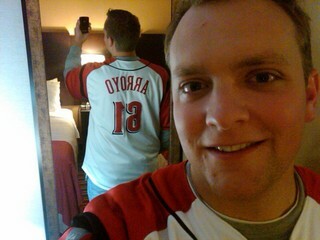 I wore my Arroyo jersey so show my support. This morning we tried a local diner called, Oregon Diner, great food....and plenty of it. Nice thick slices of bacon and plenty of home fries. We interviewed a few Philly fans and also a few Reds fans to get their take on game 1 and how they think game 2 will go. Which is where I am now. 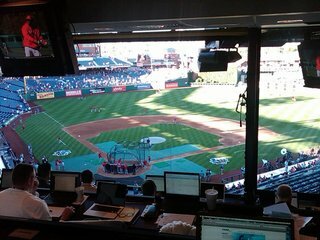 I am in the press box, and you can see the picture of the field as Philly is out there for batting practice before the game. Everyone is talking about the no-hitter, but I have a sneaking feeling that today will not turn out like Wednesday. Arroyo is a solid pitcher and has pitched in the playoffs before. I am really hoping Chapman gets some time on the mound. Watching all the flashes from cameras in Cincy was one thing, but this will be Phillies first chance to see the Cuban Missile. We will see how things turn out, but I have a feeling Cincy could pull this one out. Only time will tell. Go Reds and have a good one!